DCI prepared a stormwater plan for Option 2B of the fifth segment of the Intercounty Connector (ICC). The 18-mile ICC begins from the west at I-270/I-370 in Montgomery County, MD and ends at US 1 in Prince George’s County, MD. This fifth segment of the ICC includes; construction of MD 200 from Sta. 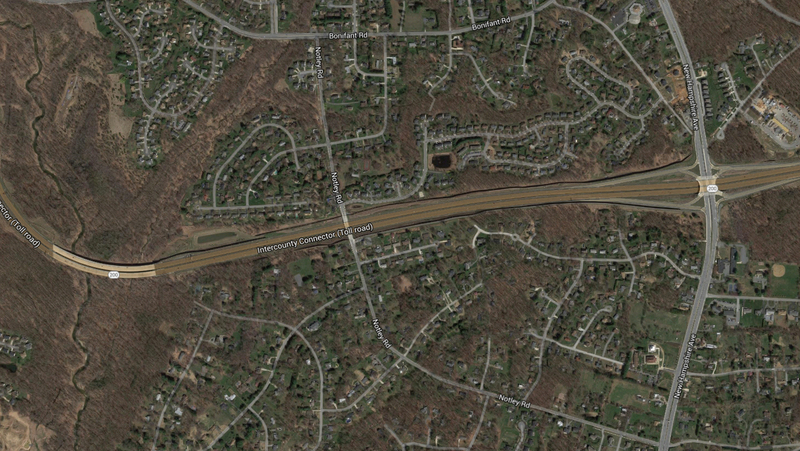 980+00 to the connection with Ramps VE and VW; construction of Ramps VE and VW connecting MD 200 to Virginia Manor Road and the reconstruction of Virginia Manor Road from approximately Station 14+25 to Station 48+40. This segment of the project was originally designed using four traditional structural Best Management Practices (three ponds and a sand filter) we redesigned the stormwater facilities for this segment using Low Impact Development Techniques to meet the newest Maryland Department of Environment regulations. Using bioswales we were able to eliminate two of the ponds and the sand filter. The water quality volume, recharge volume, and channel protection volume were addressed using 17 bioswales. Inlets were placed in the bioswales to limit the drainage area to any one segment to 1 acre, limit the Pe runoff velocity to 1 fps limit the 10 year runoff velocity to 4 fps, limit the Pe runoff depth to 4”, and bypass larger storm events. Overbank Flood Protection control for the 24-hour, 10-year frequency storm was addressed be addressed using a dry pond at one of the four points of study.